Imagine being able to buy the majority of radio stations in one market with just one phone call or email! That’s what you get with the Finger Lakes Radio Group. Some of the major radio companies have moved signals in the Finger Lakes market into Rochester and Syracuse. They’ve left the market to us and the Finger Lakes market is very substantial! Plus Finger Lakes Radio Group can help you reach hundreds of thousands of Finger Lakes residents through the internet, social media and live events! Watch this quick video find out more about the Finger Lakes market. The Finger Lakes is a market separate from Rochester, Syracuse, Ithaca or Elmira. Much of the Finger Lakes area is not in a Nielsen Metro so when you buy off the Syracuse and Rochester Metro you are missing close to 160,000 people! 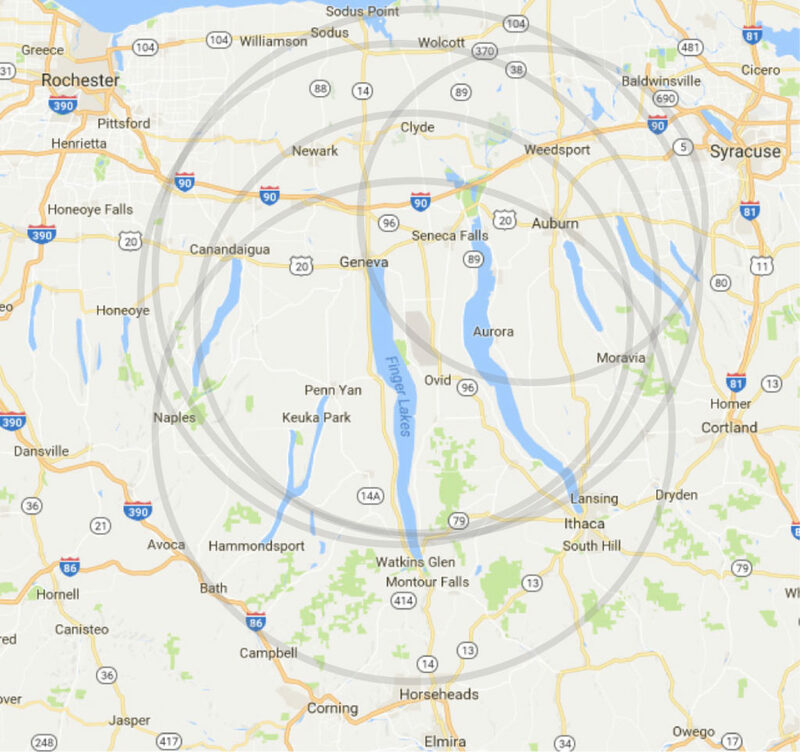 If the Finger Lakes area were a Nielsen Metro it would be more than twice as big as Ithaca or Watertown and 33% larger than Elmira! To achieve the same geographic reach you’d have to buy three different cable systems, 3 different TV markets, or 6 different newspapers and that would cost a lot! With 93% penetration, radio can out deliver any media including Google or Facebook! You might think you get good reach with Rochester or Syracuse radio stations. According to Nielsen Audio, only 1.9% of the audience for top Syracuse stations is in Finger Lakes counties. Only 2.8% of top Rochester station’s audience is in our market. If you need to reach Cayuga, Seneca, Wayne, Yates, Schuyler or Ontario counties, you need to contact the Finger Lakes Radio Group. Frequency is what drives results. You can get the frequency you need with our competitive rates! Download this quick fact sheet about weekly media reach. The Finger Lakes Radio Group owns the only Adult Contemporary, Classic Rock, Classic Hits, and News/Talk stations in the entire area between Rochester and Syracuse. While location, location, location is the key to retail success…local, local, local is the key to our success and that of many businesses in our area. It’s important for regional and national chains to have a local feel. When you advertise with us, we loan you our local image to help build yours. We can do local promotions for stores in Canandaigua, Newark, Geneva, Penn Yan, Seneca Falls, Waterloo, Auburn. It’s too far to travel for Syracuse and Rochester radio stations. Hundreds of area businesses have used our stations with great success for over twenty years. Many national and regional advertisers buy us even though they buy Syracuse and Rochester Metros as well like: McDonald’s, Crouse Hospital, Chinatowne Furniture, Greater Rochester International Airport, Dunkin’ Donuts, Simmons Rockwell Auto Dealerships, EFPR Group, Isaac Heating, Rochester Regional Health. Since you are already here… you can also fill out the form below to contact one of our agency specialists.